Groundnut rosette disease is the most destructive viral disease of peanut in Africa and can cause serious yield losses under favourable conditions. The development of disease-resistant cultivars is the most effective control strategy. Resistance to the aphid vector, Aphis craccivora, was identified in the breeding line ICG 12991 and is controlled by a single recessive gene. 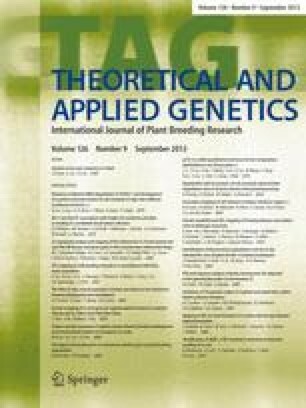 Bulked segregant analysis (BSA) and amplified fragment length polymorphism (AFLP) analysis were employed to identify DNA markers linked to aphid resistance and for the development of a partial genetic linkage map. A F2:3 population was developed from a cross using the aphid-resistant parent ICG 12991. Genotyping was carried out in the F2 generation and phenotyping in the F3 generation. Results were used to assign individual F2 lines as homozygous-resistant, homozygous-susceptible or segregating. A total of 308 AFLP (20 EcoRI+3/MseI+3, 144 MluI+3/MseI+3 and 144 PstI+3/MseI+3) primer combinations were used to identify markers associated with aphid resistance in the F2:3 population. Twenty putative markers were identified, of which 12 mapped to five linkage groups covering a map distance of 139.4 cM. A single recessive gene was mapped on linkage group 1, 3.9 cM from a marker originating from the susceptible parent, that explained 76.1% of the phenotypic variation for aphid resistance. This study represents the first report on the identification of molecular markers closely linked to aphid resistance to groundnut rosette disease and the construction of the first partial genetic linkage map for cultivated peanut. This publication is an output from a research project funded by the Department for International Development of the United Kingdom. However, the Department for International Development can accept no responsibility for any information provided or views expressed (DFID project code R7445, Crop Protection Programme).